Today is Wednesday, so I am sharing what is on my work desk with you! I am sure you are all a bit like me. You have a local hobby shop you love to visit. Scrapper's Playground is a scrapbook shop that is nearby and always has just what I am looking for. Unfortunately, I found out they are closing their doors. I spent Saturday afternoon shopping there and picked up a lot of goodies. While shopping, I felt just a sad feeling like I am saying good-bye to a good friend. This store is where I met a lot of lovely people, and even got to attend a class taught by Tim Holtz. 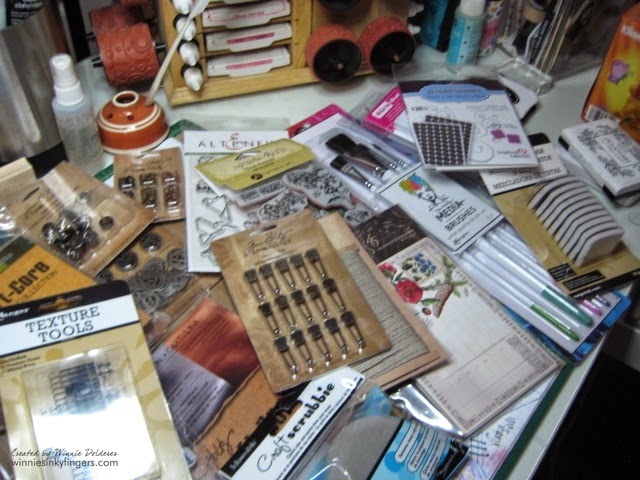 You will notice that a lot of my goodies are by Stamper's Anonymous and Tim Holtz and Ranger. It seemed fitting for me to purchase these items from the store since they made it possible for me to attend a class with Tim. I am looking forward to many happy hours of stamping and creating and will remember Marie and the staff of Scrapper's Playground for all the good times! Thank you to Julia for the desk-hopping fun! I look forward to seeing what you are all working on! I heard they were closing from all the way over in South Africa! So sad when a store closes. One of our local stores is also closing next month. I feel for the owners as they wont have come to the decision lightly. I do like all you Timmy stash. .being a Tim addict myself, I really appreciate what you have on your desk. Ooh! Lots of lovely goodies. My local craft shop has just closed down to. It is such a shame that we have to buy more and more online nowadays. I prefer to browse around a shop. Thanks for stopping by earlier. That lot is amazing, you could start your own shop though I am sure you wouldn't want to part with any of it. 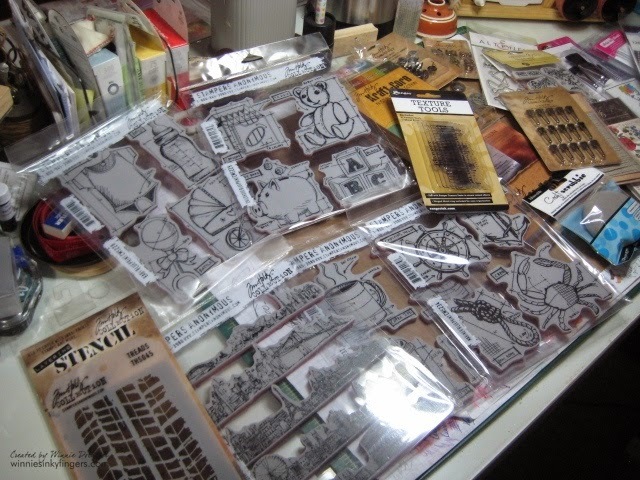 A god haul of new stamps to use but sad to see another small business close its doors. I purchased a fair bit of product from a gal that ran her shop from her home when she decided to move on. I've resorted to buying my stamps online from a couple of favourites in the U.S. So sorry to see another LSS closing it's doors. But what an amazing haul. This should keep you happy and busy and bursting with joy for quite some time. Oh it's so sad when a local shop has to close. But even sadder if it is your fav craft shop! But you now have quite a large haul of stamps and goodies.I'm looking forward to seeing some of the things you do with them. How sad. We had a store that was open for only a year. Unfortunately the hours she was open wasn't conveinent for those working full time. How nice that you bought a lot of supplies that will give you great memories of the staff and your class with Tim! Thank you for visiting me earlier. I'm slowly making the rounds. I know how you feel Winnie! I felt sad when my local scrappy store closed too! I miss the items but I also missed chatting with the store owner and the friends I made in the classes. I'm glad you were able to buy lots of great goodies from the store. Other than this, I hope you're having a nice week! Sorry about the store closing. I know how that goes. Looks like you did okay with your purchases. Enjoy! So so sad that another store is closing down! I always jump on my soap box during my classes to always support the SB stores...it just breaks my heart, and makes my job harder. Great purchases though...good for you!